There are many myths about the name you are given depending on which community you come from. For some it will be an incarnation of your descendants you will carry their traits, physical features, their good tidings and God forbid the curses that befell them. Religiously speaking, the continuous profession of your name every time someone calls you is what gives naming a child enormous weight. Bruno has no idea which might have played a part into his life. His name is the same as the well known singer song writer Bruno Mars. Just like the pop star, Bruno writes for other artists, plays the guitar and sings as well. He has little recollection of how music came to him but he suspects that his parents are the source of every lyric he has ever written. Bruno’s father was a well known musician in Milimani, Kisumu owing to the fact that he headed the Milimani Catholic Choir where his mother was a member. We can pretty much guess the ending to the story; three amazing children and a happy home that makes Bruno smile at the memory. His father died when he was 5 years old and his mother at the age of 7 or 11 years old. He cannot remember the cause of death as it was and still is a big blur to him. Born in Kisumu he attended Jacaranda Academy in Kilimani and it was during this time that his aunt from Nairobi bought him a bike. He describes their relationship as effortless. So when his parents died there was no family meeting to discuss where he would live. His aunt packed his bags and they made their way to Umoja Estate in Nairobi. Bruno began career as many artists do, at a travelling theatre troupe based in Huruma shortly after high school. In what looks like nonchalance to the thought that he never wanted to be there anyway, he tells me of the day he quit. They had just wrapped up a tour around schools. They got to a shopping centre where everybody but him, went on a shopping spree. It is during this time that he discovered that he barely made a third of what everyone else did. He however relishes the trips he made from Umoja to Huruma for rehearsals. At one time he contemplated to buy skates and skid all the way to Huruma. He found himself helping his aunt out with her business. One day while at the shop he ran into an artist whose career he had admired. He requested to learn how to play the guitar from him. The artist asked him to sing right there in the middle of the street. This narrative is glaringly familiar with many artists globally, understanding that you only get one chance to impress for a record deal. Bruno wanted to learn how to play the guitar. That one moment ended up being regular sessions with various artists and he slowly acquired his sound. Bruno found out about the Twaweza Live Concert auditions hours to the opening of registration. He often made the Kisumu- Nairobi trip where he stayed with family. On this day however, the stars were scattered, he was in Nairobi with no fare to travel home. A friend offered him transport only for him to find fully booked buses. The booking office attendant kept promising that there was a seat in the next bus. Bruno made peace with the fact that he might not make it to the auditions. At 1am a bus pulled up and there was only one seat. When he got to the Acacia Premeire Hotel where the auditions were happening he secured the slot number 19. 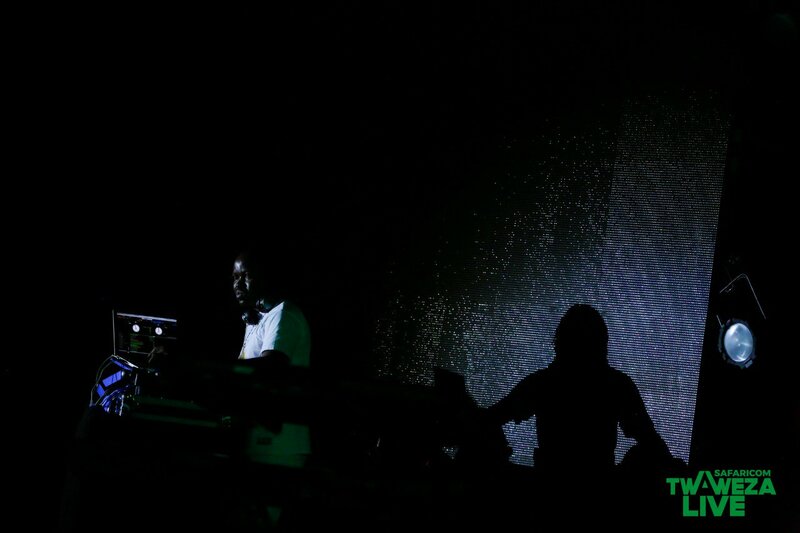 A minute was all he had but a few seconds into his set, one of the judges stopped the performances making technical adjustments that were compromising his set. He had another minute and he gave it his best. Instead of going home to catch up on some much needed rest he stayed and watched the rest of the auditions. At the close of the auditions judges said that the winner would be announced the next day. Bruno went home and did his laundry as his mind rest. The next day he got a call from a camera man requesting for a do-over of an interview that he had done the previous day. The catch here was that he needed to be in the same clothes as the day of the audition. The iron box saved the day and in two hours the crew was at his aunt’s doorstep .Somebody else came as well. All the three judges surprised him and announced his victory. Now he has done one single with the Hart the Band that is just about done. 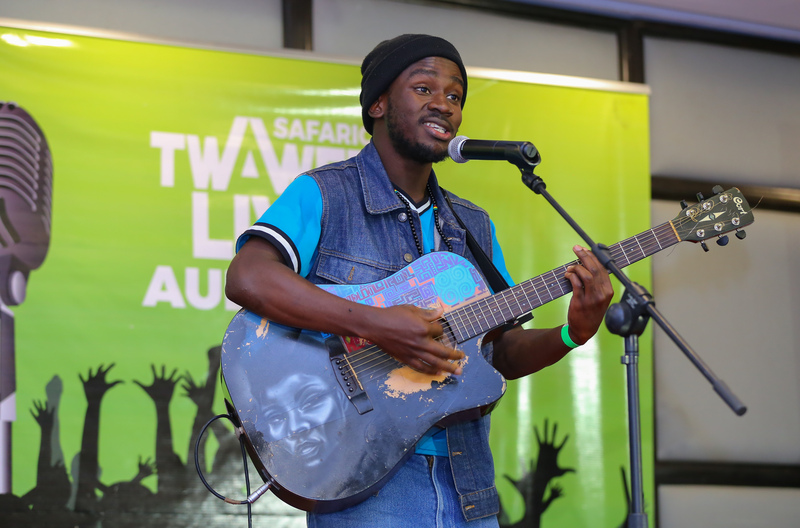 I sample the chorus and the conversation segues to other experiences from Twaweza live Kisumu. It is here that he made a friend, Pascal. ‘Third name private,’ He says when I request for him for his full name. Until a week ago, Pascal was a geography teacher who in 2017 delivered an 8.5 mean score. A craft that he loved though forced on him by his mother. His mother walked up to the registrar saying that no son of hers was going to study journalism. He needed to do a serious course that could secure him a job. Among the proposed ones were engineering, medicine and law. He picked education instead. Behind the many books his a passion for decks. Pascal is a freelance DJ who initially used the name DJ P. During one of the many campus events, he approached the director of entertainment asking for just 3 minutes to show his stuff. The song that stole the crowd was ‘Get Down’ by Madtraxx. There was something there that 6,000 people enjoyed. His mother accepted his newly found ‘hobby’ because it made the financial burden easier. His very first paid gig offered him Kes. 9,000/- that went a long way to making that semester easier. Once on a trip to Nairobi he met up with a friend, then DJ Babz who introduced him to DJ Joe Mfalme. ‘I simply told him (DJ Joe Mfalme) that I was not going back to Kisumu till I knew to DJ’. DJ P went back with a new energy and a name given by DJ Styles of Code Red, DJ Pscratch because of his skill to scratch. He later tried out for Pilsner Mfalme (2011) the famed Deejaying competition and he made it to the quarter finals. Subsequently, in 2012 he made it to the semi-finals in the same competition. In movies we see neighbours offer pies as a welcoming gift to a new neighbour. While living in Lolwe, Kisumu he got his own share of a welcome. His house robbed of anything that could be sold on OLX. Among those stolen was a DJ player that he used which he planned on upgrading to a full Deejaying kit. He blames the cases that the kit comes in for that incident. Clubs in Kisumu like Rowan Rooftop and Buddies that greets you as enter Kisumu shopping centre gave him a few paid gigs and this gave him another chance at saving up for decks. I wonder if he ever loathed his teaching job when a student was a pain in the neck. ‘No I really liked to teach. It is now that I have quit to pursue Deejaying fulltime’. This is the kind of optimism that gets people robbed of all their earthly possessions. He did not worry about his scratch getting rusty either. Deejaying is something he can do in his sleep and all he needed was an opportunity. He got more than that, a minute and 18,000 people waiting to be entertained. In 60 seconds he sampled six songs and the crowd wet ham, much like it had back at Maseno University. His win and a head to head session with DJ Joe Mfalme at the Twaweza Live Concert was more than he bargained for. He must have done something right, that 8 years later he would share a stage with a man he had looked up too for so long. DJ Pscratch wants to be the hottest DJ in Kisumu, Kenya and East Africa. Much like his deck hero, he wants to start an events company that will house a radio station. That is the long term, now he needs to top up his savings and buy a deck. He loves that a few people can recognize him although trending on twitter was not in the plan. For him the Twaweza experience elevated his brand and he is ready to put in the work to see him achieve his dreams. It is easy to believe that going back to your rural home because you are broke is something that happens to other people. Not when life seems to be getting better. Chris was born in Mathare in Nairobi, the first born in a family of four. Life picked up for them after his father’s job did better than they had all expected. With that they moved to Saika and Chris joined Moi Forces Academy. And because luck disappears when you are not looking, theirs got away from them. His father lost his job as driver and salesman and they packed their bags and headed back to Kisumu. There they would get a fresh start and rebuild the way back to Nairobi. This is what Chris thought would happen. Now seven years later he believes that it is possible to completely lose everything. His mother found hope at Kolal Primary School teaching young minds. ‘I am really proud of her and anything she does’. Chris also found himself a teacher of an unconventional trade. He teaches dance to teenagers under at the Child Development Management by Churches under the Episcopal Church. He has no qualms about it, save for teenage tantrums that he will never get used to. His father was not lucky. The move took a toll on him causing stress that weaved into depression. As if life wanted to rubberstamp its cruelty, doctor’s found a tumor in his head. Two surgeries later there was hope but they lost him just before the third surgery. Chris believed that he would be the only hype man in Kisumu and believed the audition would breezy only to find 23 other gentleman. He also noticed that there were no women in their category and to that he is working with Carol an up and coming MC who he believes would do well in Hype. He was first to audition and as soon as he was done his hero walked in. He badly wanted Jalang’o to watch him but his minute was done. He watched others shine and judges being in awe. 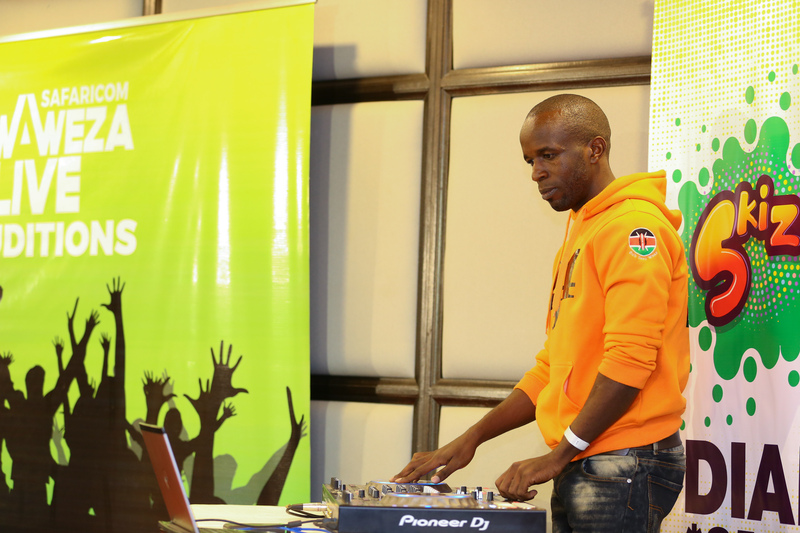 Long after the auditions, the DJ was entertaining the crowd and the official MCs had gone back to their hotels. This was an opportunity. He got on stage and worked the crowd to what he defined to as an energy he has never seen. The next day he got a call with an offer for a job and the event organizer who was willing to pay him a deposit for the job. He was needed the next day for the event and the caller asked whether there was anything that could clash with the planned time for the event. Chris said he had gone for an audition the previous day but had not received a call so he was available. ‘This experience will allow me to go study sound engineering and begin my journey to being a mega producer and hype man at the global stage. This concert affirmed my talent and I got to meet people I admire so I know anything is possible’. The thing he carries with him as well is the desire to build his mother a house and support his siblings through their studies and see them achieve their dreams. ‘My dad never supported me because he wanted me to have a more stable career but I know he would be proud of me’. You have my support son , the only hype man in kisumu. Keep it up.